To Cite: Torkmannejad Sabzevari M, Khalili H, Rad M. Non-Pharmacological Treatments of Pruritus in Hemodialysis Patients: A Review Study, Jundishapur J Chronic Dis Care. 2018 ; 7(2):e67794. doi: 10.5812/jjcdc.67794. Context: Pruritus in hemodialysis patients is one of the most common disturbing symptoms in patients with chronic renal failure. Non-pharmacological treatments can be useful in reducing patients’ pruritus, however, few reviews have been published in this regard. The aim of this study was to provide non-pharmacological treatments for hemodialysis patients. Evidence Acquisition: The review study was conducted by searching electronic databases and search engines since 1990 to October 2017. The articles were included in the study that examined the effects of non-pharmacological treatments on pruritus in hemodialysis patients. Results: A total of 13 studies on non-pharmacological treatments affecting pruritus were reviewed. These treatments included phototherapy, aromatherapy, high flux dialyzer, acupressure, and cold dialysis. A review of studies has shown that phototherapy is not effective in treating the hemodialysis patients’ pruritus. High flux dialyzer had the most effect in reducing pruritus. Other non-pharmacological treatments such as aromatherapy, acupressure, and cold dialysis also had an effect on pruritus relief. Conclusion: Finally, it can be concluded that high flux dialyzer is an effective non-pharmacological way to control pruritus during hemodialysis. However, little studies have been done on therapies such as acupressure and cold dialysis. A repeat of these studies with a larger sample size are recommended. Chronic renal failure is a progressive and irreversible clinical disorder in renal function in which disturbed the kidney’s ability to maintain balance of fluid and electrolytes as well as the disposal of waste materials and toxins, leading to azotemia or uremia (1). Hemodialysis is the most common treatment for kidney failure (2). Although hemodialysis is an effective and life-sustaining treatment for chronic renal failure patients, it has adverse and unpleasant side effects (3). Thus, the incidence of these complications during dialysis may be unpleasant and intolerable for the patient and lead to early termination of the patient’s hemodialysis or inadequate dialysis (4). Itching, as the most common skin complication in dialysis patients, is a subjective unpleasant and anxiety inducer symptom. Itching causes desire to scratch and leads to disruption in skin integrity. As a result of itching, scratching stimulates the secretion of histamine from inflammatory cells and free nerve endings. Following an increase in the secretion of histamine, itching is intensified so that the vicious cycle of itching-scratching is repeated (5). Different types of itching, based on their origin, include itching associated with psychological, skin, neuropathic, and systemic problems. As reported, chronic renal failure induce the most commonly systemic pruritus (6). The incidence of pruritus in chronic renal failure is 42% and in patients with hemodialysis, 90% (7), of which 52.5% of the patients had the most severe feeling of itching during dialysis (8). Accordingly, although access to hemodialysis has been shown to maintain and sustain the chronic renal failure of patients’ survival and improve the general health, it has increased the number of patients with itching (5). The physiopathology of pruritus in patients with chronic renal failure is still unknown (9). However, various hypotheses have been proposed to justify it: release of histamine from mast cells and basophils, dryness and skin atrophy, proliferation of skin mast cells, atrophy of skin fat cells, electrolyte imbalances and the accumulation of bile acids, anemia, increased skin pH and hyperparathyroidism (10), opioids, hypersensitivity to hemodialysis solution (11), and high levels of interleukin 2 (12). Considering that the highest severity of itching has been reported during hemodialysis (8); itching during hemodialysis may be due to inflammatory mediators such as IL-I, which is released in response to plasma C5a when exposed to the dialysis membrane. In skin biopsies of patients undergoing dialysis, a significant increase in mast cells has been reported, and it has been suggested that the stimulation and proliferation of mast cells and the release of its mediators, such as histamine, interleukin and proteases, will not be due to CRF, but rather due to the dialysis process (13). Regarding the uncertain physiopathology of itching, various treatments have been proposed to relieve it, including intravenous administration of lidocaine, oral administration of cholestyramine and antihistamines, active charcoal, low protein diet, magnesium-free dialysis, needle electrical stimulation, parathyroidectomy (14) ultraviolet radiation therapy (7, 9, 14), topical treatments (capsaicin) (11) systemic treatments (Doxepin, gabapentin, Pregabalin, Nalfurafine and thalidomide) (9, 14, 15), acupuncture (16), aromatherapy (14, 17), and vinegar (18). Itching in patients undergoing hemodialysis causes physical, mental dysfunction, and even impairment in sleep quality, which can impair the quality of life of patients (19). Uremic pruritus has created a disappointing condition for both the patient and the health care provider, as there is currently no definitive effective treatment to relieve it (7). Regarding the fact that nurses as health care providers have always tried to eliminate the patients’ illnesses and physical and psychological problems, pruritus as a common skin complaint in patients undergoing hemodialysis requires nursing intervention. Non-pharmacological treatments don’t require the physician to prescribe to relieve hemodialysis itching. Moreover, most of these interventions are accompanied by the patients’ favorable compliance. Many medical personnel have no knowledge of non-pharmacological treatments of itching during hemodialysis or itchy stroke due to chronic renal disease. Currently, different methods of non-pharmacological treatments, included phototherapy, aromatherapy, high flux dialyzer, acupressure, and cold dialysis are not used enough in Iran. One of the main reasons is that few studies are conducted on the use of these treatments. On the other hand, there are some problems with using pharmaceutical methods in hemodialysis patients with pruritus in Iran. The results of a study indicated that the prescription and consumption of drug such as intravenous administration of lidocaine, oral administration of cholestyramine and antihistamines, active charcoal, Doxepin, gabapentin, Pregabalin, Nalfurafine, and thalidomide have complications and costs for patients (14, 15). Obviously, if simpler and safer methods are available to control pruritus in hemodialysis patients, it is better to use these treatments. Non-pharmacological treatments can be considered an easy, safe, available, and appropriate method. There are no review studies regarding non-pharmacological treatments of pruritus in hemodialysis patients in Iran. Therefore, comprehensive information should be provided to medical and paramedical personnel using a review study. Therefore, this study was conducted with the aim of evaluating non-pharmacological hemodialysis pruritus treatment using extensive review in valid scientific literature. Non-pharmacological clinical trials that were performed to treatment of itching in hemodialysis patients were reviewed. The search strategy was performed using this key words: “chronic renal disease”, “hemodialysis”, “pruritus”, “non pharmacological treatment” “acupressure”, “aromatherapy”, and “cool dialysate”. Searches from 1990 to October 2017 were available in searchable databases including electronic databases and search engines such as MEDLINE, excerpta medica database (EMBASE), cumulative index of nursing and allied health literature (CINAHL), Islamic world science citation center (ISC), Google Scholar, international scientific indexing (ISI), alumni medical library (MEDLIB), Magiran, and scientific information databases (SID). The searches were done in both the English and Farsi language, and a summary of articles written in English were reviewed. Two authors independently evaluated the titles and abstracts of all searched texts and each of the articles that were consistent with the purpose of the study examined the entire text. The disagreement over whether or not to allocate articles coincides with the examination of the entire text in coordination with each other. To extract information and collect them, a was was used including title, first author, journal name, year of publication, place of publication, population, study design, duration of intervention, means of measuring pruritus, and severity of pruritus before as well as after intervention. The inclusion criteria were as follows: 1, only interventional and cross-over clinical trials on non-pharmacological hemodialysis pruritus were included; 2, studies on patients with hemodialysis above 18 years old; 3, all of the selected studies used a ten-point pruritus tool 4, pruritus studied as a variable; 5, studies conducted in English and Farsi, and 6, studies conducted from 1990 onward. The exclusion criteria were as follows: 1, abstracts and 2, having no control groups. After searching the data bases, a total of 13 articles that completely evaluated the effect of non-pharmacological interventions on hemodialysis patients’ pruritus were included (Figure 1). A total of 689 patients studied in the article had been entered to review. The interventions included were phototherapy, aromatherapy, high flux dialysis, acupressure, and cold dialysis. The range of samples in each study varied from 20 to 166. Most studies were conducted in China, Korea, Turkey, and Iran. The studies design consisted of 7 parallel randomized clinical trials, 2 semi-experimental studies, and 2 cross over clinical trials. In all studies, subjects were adults over 18 years old that have received hemodialysis. The duration of the intervention was two weeks to one year (Table 1). Ro (18) South Korea Cross Over Hemodialysis patients 21 Visual analogue scales 0-10 itching Lavender with tea tree oil for two weeks Odorless mineral oil for two weeks Lavender and tea tree oil reduce aroma the degree of itching in hemodialysis patients. Shahgholian (15) Iran Cross over clinical trial Hemodialysis patients 20 Visual analogue scales 0 - 10 itching Lavender with peppermint and tea tree oil for 6 sessions (two weeks) at 3 - 5 cc massage with almond oil The study showed that massage with aromatic oil and massage without aromatic oils significantly reduced itching scores after the first and second stages of the study, but there was no significant difference between the two methods. Kang (23) Korea Parallel semi-experimental Hemodialysis patients 28 subject, 30 Control Visual analogue scales 0 - 10 itching Combinationmassage of lavender, chamomile and geranium Control Aromatherapy with lavender, chamomile and geranium massages is effective on itching, fatigue and stress in patients. Zhang (25) China Paralell clinical trial Hemodialysis patients 40 Visual Analogue Scales 0 - 10 itching HDF filtering with hemperfusion using HAHP cartrilage and AV600 polysolofon filter every 4 weeks for 12 weeks Resin filter HA130 every 4 weeks for 12 weeks HDF filter with hemoperfusion was more effective in reducing itching in hemodialysis patients. Yan (29) China Paralell clinical trial Hemodialysis patients 71 Visual analogue scales 0 - 10 itching The acupressure (auricular) was used three times a week for 6 weeks to measure the effect on the severity of itching, in which the patient pressed points 5 - 8 once a day. There was no intervention in the control group The acute compression of auricular was more effective in reducing itching than the control group. Rad (2) Iran Paralell clinical trial Hemodialysis patients 71 Visual analogue scales 0 - 10 itching The intervention group was taken cold dialysis solution (35.5°C) for one week (3 sessions) The control group continues to be treated with usual dialysis solution (37°C) The cold dialysis group had a greater reduction in itching. Ko, 2011, compared two methods of phototherapy to reduce the itching of hemodialysis patients so that a group has received ultra-violet B receptors with a droplet of 210 milligrams per square centimeter and gradually increased its dose. In the other group, it has received phototherapy with ultraviolet A radiation with high doses of 106 mjole/cm2. Phototherapy was performed in both groups three times a week for 6 weeks. The results showed no significant difference between the two groups regarding the degree of itching. In the ultraviolet group with B spectrum, the itching rate was 3.53, while in the ultraviolet-A phototherapy group with high waves, the rate of pruritus was 3.38 (20). Hsu, 2009, which used distant infrared radiation for 15 minutes twice weekly at 40°C for 9 weeks and compared it with the control group, found that the rate of itching in the infra-red group was 42% and in the placebo group was 35%, which did not show a significant difference between the two groups in terms of reducing itching (21). Curcani et al., studied the effect of aromatherapy on itching in patients undergoing hemodialysis. In the intervention group, the itching rate was 7.2 ± 3.14. Compared to the control group, itching rate was 10 ± 2.47, which showed a significant difference with each other. He concluded that aromatherapy can affect hemodialysis patients’ itching (22). Shahgholian et al., conducted a cross-over clinical trial study. Convenience sampling was done and samples were selected of hemodialysis patients who underwent hemodialysis three times a week, each session for 3 - 5 hours, and had a pruritus score of more than 3. Then, they were randomly assigned in two groups. Samples of massage group with / without aromatic oils initially received 6 sessions of massage with aromatic oils and then 6 sessions of massage without aromatic oils. The order of intervention in the massage group without / with aromatic oil was the opposite of the first group. Between periods of intervention, they devoted a week to wash out. Massage was performed for 7 minutes on the arm, forearm, and hands without fistula. In the aromatherapy massage, they used 3 to 5 milliliters of lavender, peppermint, and tea tree oil with 5% purity; the sweet almond oil was used in the massage without aromatic group. The study showed that massage with aromatic oil and massage without aromatic oils significantly decreased pruritus after the first and second stages of the study, however, there was no significant difference between the two methods (15). Ro and colleagues evaluated the effect of aromatherapy of lavender and tea tree oil by cross-over method in comparison with mineral oil on itching in hemodialysis patients. They used massage oil three times a week for 4 weeks. After two weeks of washing out, subjects received aromatherapy in the same way. The researchers observed that the score of itching significantly decreased after intervention (18). Kang measured the effect of aromatherapy on itching, fatigue, and stress in hemodialysis patients. In this quasi-experimental study, the massage group received a combination of lavender, chamomile and candlesticks; they reported less frequent itching, fatigue, and stress compared to the control group (23). Jiang (2016) compared the effect of two dialysis filter with different ultrafiltration on itching and concluded that ultrafiltration-enhanced dialysis could greatly reduce the itching of patients undergoing dialysis. He dialyzed using dialysis filter HFHD (with ultrafiltration 60 mL/hr/mmHg and a surface effect of 1.4 m2) three times a week for 12 weeks, while the other group used HDF with characteristics (ultrafiltration coefficient of 57 mL/hr/mmHg and surface effect of 1.4 m2). The rate of itching in the HFHD group was 9.1 ± 1.8, and after using this type of filtering, it reached 1.8 ± 0.4, which in comparison with HDF group (8.8 ± 1.6 before the intervention and after 8 hours reached to 3.2 ± 0.8) showed statistically significant differences (24). Zhang, 2016, the two filters in a group of HDF-treated with hemoperfusion using HAHP cartridges and AV600 polysolofon filter every 4 weeks for 12 weeks with another group of HA130 resin filtered every 4 weeks for 12 weeks were compared and concluded that the level of pruritus in the pre-test group was 8.08 ± 1.35 in the HDF group, which reached 3.13 ± 1.1 after the study and in the other group itching before the intervention was 8.60 ± 1.26 reach to 8.6 ± 1.3. The difference was significant. They showed that HDF filtering with hemo-perfusion was more effective in reducing the itching of hemodialysis patients (25). Hui, 2011, compared two types of dialysis filter in reducing itching of hemodialysis patients. In the first group, dialysis filter (HFHD) with ultrafiltration (46 mL/hr/mmhg and surface effectiveness of 1.4 m2) was used three times a week for one year, and in the second group, LFHD filtering (with 13 mL/hr/mmhg ultrafiltration and the surface effectiveness of 1.3 m2) in the same time period and compared in terms of pruritus before and after the study. The results were the rate of itching in the HFHD group before the study; 6.29 ± 1.5, which reached 2.66 ± 1.16 after the study. The level of itching in the LFHD group was 5.66 ± 1.53 before the intervention. After using this filter for one year the itching score became 4.95 ± 2.2. There was a significant difference between the two filters in terms of reducing itching and effectiveness (26). Chen, 2009, compared a high permeability HD (with ultrafiltration of 40 mL/hr/mmHg) with conventional HD (with an ultrafiltration of 5.5 mL/hr/mmHg) for three times a week for one year from considering the effectiveness of reducing pruritus. It was found that in the high HD permeability group before the intervention, the degree of pruritus was 6.22 ± 1.94, which after the intervention reached to 2.23 ± 1.05. In the group of conventional HD, the prevalence of pruritus before was 6.16 ± 2.78, which reached to 5.45 ± 1.91 after intervention, and the difference was significant (27). Kilic, 2016, studied the effect of acupressure on hemodialysis patients’ pruritus. In a group, acupressure was used at the L1 - L11 point. In the second group, TEAS was used at the same place three times a week for 4 weeks, and in the third group there was no intervention. In the acupressure group, the degree of pruritus before the study was 6.84 ± 1.7, which reached to 3.36 ± 2.37 after the intervention. In the TEAS group, the degree of pruritus before the intervention was 7.37 ± 1.31, which after the intervention decreased to 3.23 ± 15.2. In the control group, the level of itching before the intervention was 6.92 ± 1.41. In other groups, the level of itching in the control group was 5.65 ± 2.85. He reported a significant difference between the two intervention groups with the control group (28). Yan et al., 2015, used auricular acupressure (Auriculotherapy) three times a week for 6 weeks to measure the effect on the severity of itching, in which the patient pressed points 5 - 8 once a day. No intervention was performed in the control group, and only the severity of itching was recorded. The results showed that the degree of itching in the acupressure group, before intervention, was 5.75 ± 2.32, which was reduced to 3.84 ± 1.68 after intervention; however, in the control group, before the intervention, the itching rate was 5.6 ± 2.127, which was reported as 5.56 ± 2.28 after intervention (29). Rad et al., 2017, performed a randomized, double-blind clinical trial study on 60 patients with chronic renal failure undergoing hemodialysis suffer from pruritus during dialysis in Mashhad, Iran. A total of 30 patients were assigned in the intervention group and 30 patients in the control group. Patients in both groups received one week (3 sessions) of dialysis treatment with a standard solution of 37°C. Then, in the next step, the control group continued to receive hemodialysis with dialysis solution 37°C and the intervention group received hemodialysis with cold dialysis solusion 35.5°C for one week (3 sessions). The condition of itching during dialysis was recorded every hour during the dialysis sessions using a researcher-made checklist. The results showed that there was a significant difference between the two groups in terms of severity and duration of itching (P < 0.005), however, there was no significant difference in the extent of pruritus between the two groups (P < 0.005) (3). The main findings of this review study aimed at identifying non-pharmacological treatments of itching in hemodialysis patients showed that aromatherapy, using high flux dialysers, acupressure, and cold dialysis can be effective in treating itching during dialysis. As shown in the results, phototherapy with infrared and ultraviolet rays does not have much effect on hemodialysis patients’ itching. Treatment of itching with ultraviolet as well as other medical treatments in addition to spending time imposes a lot of cost on the patient. Ultraviolet radiation therapy has side effects such as light sensitivity, increased wrinkles and thickening of the skin, erythema, and the risk of cancer (30). Four studies have been conducted on the effects of aromatherapy with lavender alone or in combination with other aromatic substances on itching, which reported controversial results. In one study, the effect of massage was similar to the placebo. It seems that there is a need for further study in this area due to the fact that in all of the above studies, massage was used to lubricate the aromatic material and non-aromatic oil, which may have been the effect of massage on reducing itching. The use of high flux dialyzers, in contrast to low-flux dialyzers, has had a very beneficial effect on itching alleviation. It seems that these filters would have a better effect on reducing itching in hemodialysis patients by more purging blood from waste and adjusting calcium and phosphorus (5, 11). Only two studies regarding the effect of acupressure on the healing of itching in patients with hemodialysis have been included in this review, which both indicate the effect of acupressure on reducing itching. There were two methods and pressures on two different points; one of the points was in the ear. It seems that there is a need for further study in this regard. The effect of cold dialysis on itching in hemodialysis patients was studied only in one study, which reported a positive effect. It has been shown in studies that the patient is prone to itching in order to avoid being exposed in conditions where blood vessels are dilated due to the fact that heat exacerbates itching and also it is recommended to refrain from performing activities that cause sweating. Sweating can irritate the skin and lead to general itching of the body (5). One of the conditions that the patient is exposed to the heat and vascular dilatation of the blood vessels of the kidney is the hemodialysis process (31). Following hemodialysis with standard solution temperature, the temperature exchange and the heat dissipation through the dialyzer are less than the amount of heat produced by the body. As a result, the body temperature rises, in response to this, vasodilatation occurs (32) and sweating increase. Having exposure to heat and sweat increases itching in patients during hemodialysis. In addition, various studies have shown that the use of cold compresses, ice fragments, or cooling agents can help vasoconstriction as well as help itching relieve (5). Cold effect on the blood vessels of the skin and vascular contraction reduces the release of pruritus stimulants. The cold affects the nerve membranes and reduces their irritability (33). Despite all the possible mechanisms mentioned for the effect of cold dialysis, this study was the only study available, requiring further investigation in this field. Non-pharmacotherapy for controlling itching in hemodialysis patients included phototherapy, aromatherapy, use of high-flux dialyzers, acupressure, and cold dialysis. A review of studies has shown that phototherapy is not effective for hemodialysis patients. High flux dialyzers had the most effect in reducing itching. Other non-pharmacological treatments such as aromatherapy, acupressure, and cold dialysis also had an effect on itching relief. In the case of aromatherapy, the results of the studies are controversial, which requires further study in this field. While searching the databases and journals manually, there may be articles that are under print but not yet indexed in databases, or the researcher does not have access to them and not included in the study. If a study was published in any other languages other than English and Farsi, they would not be considered. Except for before mentioned search engines and databases, there were databases that did not search, and it was possible to find articles that were not examined. This review study had several strengths: 1, this study was the first review study to investigate non-pharmacological treatments of pruritus in hemodialysis patients in Iran, which reviewed both domestic and foreign articles; 2, the review considered both randomized clinical trials and cross over studies. Medical teams can use the results of the current study to have a more extensive look at the use of non-pharmacological treatments to control pruritus in patients undergoing hemodialysis. One of the most effective methods for reducing hemodialysis pruritus is the use of high-flow dialyzers. Other methods that the team can use in practice and education include aromatherapy, acupressure, and cold dialysis. 1. Biniaz V, Sadeghi Shermeh M, Tayebi A, Ebadi A, Nemati E, Honarvar H. Relation of Serum Uric Acid With C-reactive protein and ferritin levels in patients undergoing hemodialysis. Jundishapur J Chronic Dis Care. 2014;3(4). doi: 10.17795/jjcdc.23350. 2. Rad M, Shomoossi N, Mirhosseini Z, Kashani E. Can cool dialysate alleviate restless leg syndrome in hemodialysis patients? J Res Med Sci. 2017;22:124. doi: 10.4103/jrms.JRMS_587_17. [PubMed: 29259635]. [PubMed Central: PMC5721490]. 3. Rad M, Jaghouri E, Sharifipour F, Rakhshani MH. The effects of cool dialysate on pruritus status during hemodialysis of patients with chronic renal failure: A controlled randomized clinical trial. Iran Red Crescent Med J. 2016;19(1). doi: 10.5812/ircmj.34759. 4. Assadi Hovyzian S, Fayazi S, Sharhani A, Ayoubi M, Mosaviasl S. Comparative examination of the life quality in hemodialysis patients and kidney transplant recipients in the educational-medical centers of Ahvaz. Jundishapur J Chronic Dis Care. 2017;6(3). doi: 10.5812/jjcdc.57858. 5. Ramezanpour A, Fallah R. Association of hemodialysis and pruritus in chronic renal failure. Iran J Dermatol. 2007;10(41):236-9. 6. Shariati A, Abbasi A, Mojer LM, Ghorbani M. Comparison of the effects of oral charcoal capsule with Aluminum Hydroxide syrup on pruritus in hemodialysis patients. J Guilan Univ Med Sci. 2010;18(72):22-9. Persian. 7. Tajbakhsh R, Dehghan M, Azarhoush R, Sadani S, Kaboutari M, Qorbani M. Mucocutaneons manifestation in end stage renal disease patients under hemodialysis in 5th Azar hospital in Gorgan Iran (2009). J Gorgan Univ Med Sci. 2011;13(1):115-20. Persian. 8. Suzuki H, Omata H, Kumagai H. Recent advances in treatment for uremic pruritus. Open J Nephrol. 2015;5(1):1-13. doi: 10.4236/ojneph.2015.51001. 9. Abbasi A, Shariati A, Asayesh H, Ebrahimi M. Frequency of the uremic pruritis and its associated factors in hemodialysis patients in the Golestan Province dialysis centers in 2009. Dermatol Cosmet. 2011;2(3):150-7. Persian. 10. Mettang T, Kremer AE. Uremic pruritus. Kidney Int. 2015;87(4):685-91. doi: 10.1038/ki.2013.454. [PubMed: 24402092]. 11. Kalili H, Dashti S, Ahmad Poor P, Babaei M, Abdollahi F. Efficacy of anti-pruritis drugs in chronic renal failure: A comparative study. Tehran Univ Med J. 2006;64(4):36-42. Persian. 12. Makhlough A, Ala S, Haj-Heydari Z, Kashi Z, Bari A. Topical capsaicin therapy for uremic pruritus in patients on hemodialysis. Iran J Kidney Dis. 2010;4(2):137-40. [PubMed: 20404425]. 13. Fallahzadeh MK, Roozbeh J, Geramizadeh B, Namazi MR. Interleukin-2 serum levels are elevated in patients with uremic pruritus: a novel finding with practical implications. Nephrol Dial Transplant. 2011;26(10):3338-44. doi: 10.1093/ndt/gfr053. [PubMed: 21372257]. 14. Ghaderi R, Mohammadi Fard M. Comparison of the efficacy of emollient with heliotherapy for the relief pruritus in patients undergoing hemodialysis. Horizon Med Sci. 2006;12(1):42-7. Persian. 15. Shahgholian N, Dehghan M, Mortazev M, Gholami F, Valiani M. Effect of massage with aromatic oils on pruritus relief in hemodialysis patients. Complement Med J. 2013;2(4):291-302. Persian. 16. Berger TG, Steinhoff M. Pruritus and renal failure. Semin Cutan Med Surg. 2011;30(2):99-100. doi: 10.1016/j.sder.2011.04.005. [PubMed: 21767770]. [PubMed Central: PMC3692272]. 17. Kim KH, Lee MS, Choi SM. 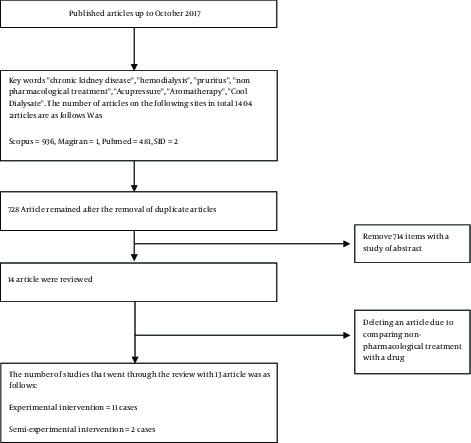 Acupuncture for treating uremic pruritus in patients with end-stage renal disease: a systematic review. J Pain Symptom Manage. 2010;40(1):117-25. doi: 10.1016/j.jpainsymman.2009.11.325. [PubMed: 21796811]. 18. Ro YJ, Ha HC, Kim CG, Yeom HA. The effects of aromatherapy on pruritus in patients undergoing hemodialysis. Dermatol Nurs. 2002;14(4):231-4-256. quiz 239. [PubMed: 12240499]. 19. Black JM, Hawks JH. Medical-surgical nursing. Saunders/Elsevier; 2009. 20. Ko MJ, Yang JY, Wu HY, Hu FC, Chen SI, Tsai PJ, et al. Narrowband ultraviolet B phototherapy for patients with refractory uraemic pruritus: a randomized controlled trial. Br J Dermatol. 2011;165(3):633-9. doi: 10.1111/j.1365-2133.2011.10448.x. [PubMed: 21668425]. 21. Hsu MC, Chen HW, Hwu YJ, Chanc CM, Liu CF. Effects of thermal therapy on uremic pruritus and biochemical parameters in patients having haemodialysis. J Adv Nurs. 2009;65(11):2397-408. doi: 10.1111/j.1365-2648.2009.05100.x. [PubMed: 19737321]. 22. Curcani M, Tan M. The effect of aromatherapy on haemodialysis patients' pruritus. J Clin Nurs. 2014;23(23-24):3356-65. doi: 10.1111/jocn.12579. [PubMed: 24646128]. 23. Kang SJ, Kim NY. The effects of aroma hand massage on pruritus, fatigue and stress of hemodialysis patients. Korean J Adult Nurs. 2008;20(6):883-94. 24. Jiang X, Ji F, Chen ZW, Huang QL. Comparison of high-flux hemodialysis with hemodialysis filtration in treatment of uraemic pruritus: a randomized controlled trial. Int Urol Nephrol. 2016;48(9):1533-41. doi: 10.1007/s11255-016-1364-2. [PubMed: 27379625]. 25. Zhang J, Yuan Y, An X, Ouyang C, Ren H, Yang G. Comparison of combined blood purification techniques in treatment of dialysis patients with uraemic pruritus. Int J Clin Exp Med. 2016;9(5):8563-8. 26. Hui B, Min Z, Yin C, Long G. Effect of high-flux dialysis membrane on uremic pruritus and solute clearance of maintenance hemodialysis patients. J Clin Rehabil Tissue Eng Res. 2011;29. 27. Chen ZJ, Cao G, Tang WX, Lv XY, Huang SM, Qin W, et al. A randomized controlled trial of high-permeability haemodialysis against conventional haemodialysis in the treatment of uraemic pruritus. Clin Exp Dermatol. 2009;34(6):679-83. doi: 10.1111/j.1365-2230.2008.03075.x. [PubMed: 19175617]. 28. Kilic Akca N, Tasci S. Acupressure and Transcutaneous Electrical Acupoint Stimulation for Improving Uremic Pruritus: A Randomized, Controlled Trial. Altern Ther Health Med. 2016;22(3):18-24. [PubMed: 27228268]. 29. Yan CN, Yao WG, Bao YJ, Shi XJ, Yu H, Yin PH, et al. Effect of Auricular Acupressure on Uremic Pruritus in Patients Receiving Hemodialysis Treatment: A Randomized Controlled Trial. Evid Based Complement Alternat Med. 2015;2015:593196. doi: 10.1155/2015/593196. [PubMed: 26495017]. [PubMed Central: PMC4606162]. 30. Kumar R, Deep G, Agarwal R. An Overview of Ultraviolet B Radiation-Induced Skin Cancer Chemoprevention by Silibinin. Curr Pharmacol Rep. 2015;1(3):206-15. doi: 10.1007/s40495-015-0027-9. [PubMed: 26097804]. [PubMed Central: PMC4471873]. 31. Kimata N, Fuller DS, Saito A, Akizawa T, Fukuhara S, Pisoni RL, et al. Pruritus in hemodialysis patients: Results from the Japanese Dialysis Outcomes and Practice Patterns Study (JDOPPS). Hemodial Int. 2014;18(3):657-67. doi: 10.1111/hdi.12158. [PubMed: 24766224]. 32. Sherman RA. Advancing the cold front. Am J Kidney Dis. 2000;36(2):412-4. doi: 10.1053/ajkd.2000.16167. [PubMed: 10922322]. 33. Parker KP, Bailey JL, Rye DB, Bliwise DL, Van Someren EJ. Lowering dialysate temperature improves sleep and alters nocturnal skin temperature in patients on chronic hemodialysis. J Sleep Res. 2007;16(1):42-50. doi: 10.1111/j.1365-2869.2007.00568.x. [PubMed: 17309762].